Hello and welcome to the Stamper's Dozen Blog Hop for November! Our theme this month is Happy Holidays, and I have a beautiful Christmas card to share! I topped this with a quarter sheet of Very Vanilla card stock cut 4" x 5 1/4". I embossed this layer with the Holly embossing folder - don't miss this - it is actually found in the Stampin' Up! Annual Catalog, page 195. I sponged the edges with Crumb Cake ink. 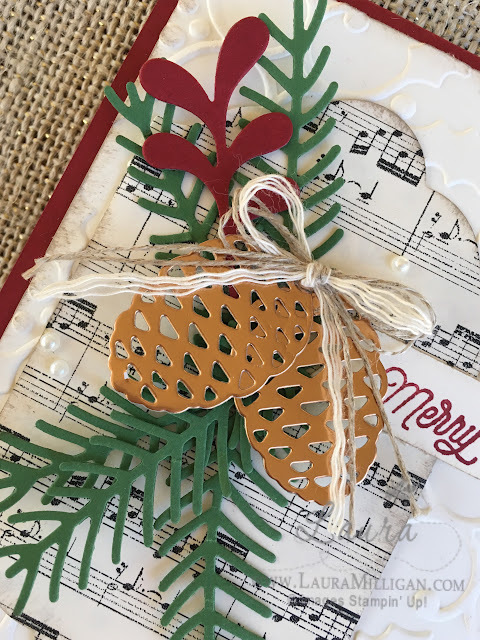 Using my Big Shot and the Lots of Labels framelits, I cut a label shape from the This Christmas designer paper -love the music paper in this pack. 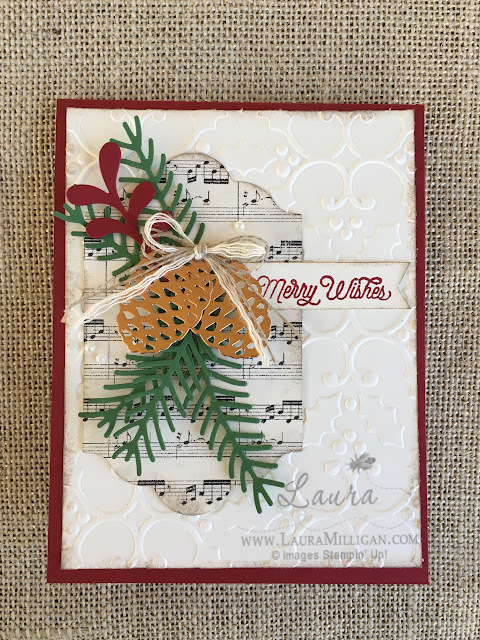 I used my Big Shot with my precison plate, to cut out the pine boughs, pine cones and red sprig and layered them together with glue dots before attaching to the label shape. The pine cones are so pretty with the Copper Foil paper. Love this! As an added embellishment, I added three pearls. I like to add these in a triangle shape. My bow is made by unraveling the thick Very Vanilla Baker's twine - and using just a few strands of it, along with some linen thread. Merry Wishes is from the Oh What Fun stamp set in our Annual Catalog, p. 31, and is 25% off during the month of November. Get it HERE for just $15.75!! Be sure to check out the other stamp sets on sale, too! Supplies used for my card are listed below, please click on any link below to shop! Don't miss out! Our On-Line Extravaganza Sale begins Nov. 21. Save up to 40% on select items! This big sale will run from Nov. 21 - Nov. 28. Great time to stock up on some thing for yourself, or to give as gifts! There will be 24 Hour sales on the first and last day of the promotion with specials deals only on those days! I will be sharing more info as soon as I know more! Thanks for stopping by today! Hope you enjoy the hop!